Dryer Vent Blockage Removal. The Lint King Clothes Dryer Vent Cleaning Experts. Call (847) 874 – 4805 Now for Service. Large amounts of snow and ice are more than just a nuisance that need to be cleared away on a cold winter day, especially when it builds up around the outside of your dryer vents. 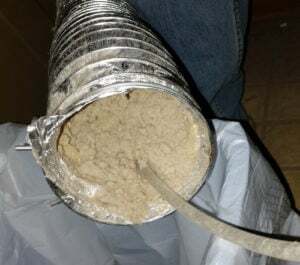 When this happens, the lint, dust and other debris that normally get carried away from your clothes and out of your house get trapped inside the dryer and dryer vent. Serious problems can occur if your dryer vent exits your home in an area that is prone to snow cover. For example, when snow drifts off the roof it can easily accumulate several feet high covering up the dryer vent below. Snow not only enters the vent, but it can also freeze over. Perhaps the most harmful effect from a snow-covered or ice-blocked vent stems from the carbon monoxide (CO) gas that can get trapped within the gas dryer and unknowingly get released back into your home or commercial building. Exposure to the gas can lead to health problems including headaches and dizziness. Prolonged carbon monoxide exposure can even lead to death. Although carbon monoxide buildup and exposure are not hazards with electric dryers, gas dryers need to be checked after every snowstorm or deep freeze to make sure they are venting properly. Blocked dryer vents waste energy because your dryer has to work harder to dry your clothes. 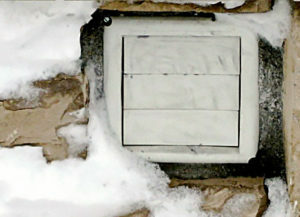 Snow and ice can prevent the dryer’s vent flapper from opening properly, which prevents cooler air into the appliance. If a dryer is blocked for an extended period of time, the lint inside the vent has been known to ignite causing a home fire. Here are 4 signs to look for if you are unsure whether your dryer vent is blocked from excessive snow or a frozen dryer vent. Lint blowing out into your room, or lint settling on your clean clothes. Lint settling on the inside and the dryer’s back panel. If you are concerned that your dryer vents may be clogged due to excessive snow and ice buildup, please contact us at (847) 874-4805 to have a trained technician from The Lint King remove the snow around your dryer vent, inspect and clean your dryer vent and ensure your dryer is safe to operate and free from Blocked Dryer Vent and Carbon Monoxide. You can also find us online by clicking here. Your 100% satisfaction is our greatest concern.